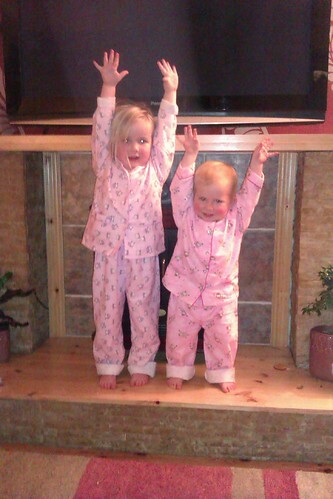 A phone shot of the girls' new pjs, a photo by PhylB on Flickr. Much as I love having my mobile phone in my pocket for snapping the odd amusing sign I want to blog and the likes, I despair in the quality of these things. Indoors, they are close to hopeless, even the 5 Megapixel ones, usually because the flash is so dire and outside they are just about passable. I find it interestingly ironic that my teenage years were documented by me with my heavy old cumbersome SLR Exakta and later SLR Ricoh so are quite clear but today's teenagers are relying exclusively on these poor quality but handy gadgets. Most kids no longer own cameras, opting for these instead. Marcel has even (very occasionally) had the audacity to claim they are no worse than my DSLR! (Rofl as they say in his speak) I am often shocked at the fuzzy, blurred rubbish he and his friends upload to facebook. As Marcel's kids flick through old albums (online) they may find it odd that the pictures of their grandmother as a 15 year old are of much better quality than those of their father at the same age! Sig mig - dit gamle Exakta - var det Ihagees Exakta? eller var det det nyere japanske? Var det det tyske - har du det så endnu? Anede Thomas, at det var det, jeg brugte i mange år? Ok, det var så det nyere japanske - jeg har af det gamle østtyske. Your kids are so cute in the pictures. I hope you post more pictures of them because they are so beautiful. This just only proves that camera phone cannot level up with a camera itself but the thing is, you can enjoy a lot of features on your phone.